A team of astrophysicists using results based upon observations of 10 quasars say they have discovered the extent to which quasars and their black holes can influence their galaxies. The researchers documented the immense power of quasar radiation, reaching out for many thousands of light years to the limits of the quasar's galaxy. The radiation released by a quasar covers the entire electromagnetic spectrum, from radio waves and microwaves at the low-frequency end through infrared, ultraviolet, and X-rays, to high-frequency gamma rays. A central black hole, also called an active galactic nucleus, may grow by swallowing material from the surrounding interstellar gas, releasing energy in the process. 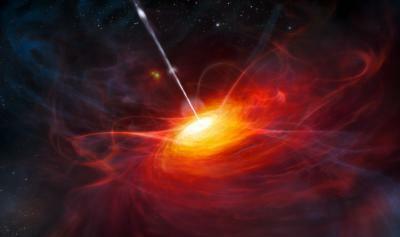 This leads to the creation of a quasar, emitting radiation that illuminates the gas present throughout the galaxy. "For the first time, we are able to see the actual extent to which these quasars and their black holes can affect their galaxies, and we see that it is limited only by the amount of gas in the galaxy," says Dartmouth Postdoctoral Research Associate Kevin Hainline, co-author of the paper. "The radiation excites gas all the way to the margins of the galaxy and stops only when it runs out of gas." The illumination of gas can have a profound effect, since gas that is lit up and heated by the quasar is less able to collapse under its own gravity and form new stars. Thus, the tiny central black hole and its quasar can slow down star formation in the entire galaxy and influence how the galaxy grows and changes over time. "This is exciting because we know from a number of different independent arguments that these quasars have a profound effect on the galaxies in which they live," says Ryan Hickox, an assistant professor in the Department of Physics and Astronomy at Dartmouth and a co-author of the paper. "There is a lot of controversy about how they actually influence the galaxy, but now we have one aspect of the interaction that can extend on the scale of the entire galaxy. Nobody had seen this before." "If you take this powerful, bright radiation source in the center of the galaxy and blast the gas with its radiation, it will get excited in just the same way the neon gets excited in neon lamps, producing light," says Hickox. "The gas will produce very specific frequencies of light that only a quasar can produce. This light functioned as a tracer that we were able to use to follow the gas excited by the black hole out to large distances." Quasars are small compared to a galaxy, like a grain of sand on a beach, but the power of their radiation can extend to the galactic boundaries and beyond. The researchers based their conclusions on observations made with the Southern African Large Telescope (SALT), the largest optical telescope in the southern hemisphere. Dartmouth is a partner in SALT, giving faculty and students access to the instrument. The observations were performed using spectroscopy, where light is broken down into its component wavelengths. "For this particular kind of experiment, it is among the best telescopes in the world," says Hickox. They also used data from NASA's Wide-field Infrared Survey Explorer (WISE)—a space telescope that imaged the whole sky in the infrared. The scientists used observations in infrared light because they give a particularly reliable measure of the total energy output by the quasar.